Spring 2017- One Room Challenge – Week 3 is the Midway Point! Spring 2017 One Room Challenge and we are halfway to a completed room for Gianna! Welcome back to my One Room Challenge where we are transforming a room in 6 short weeks and blogging about all the ups and downs! This week we are at the halfway point and we are actually doing pretty well with the deadlines and the schedule. If you want to catch up with weeks 1 and 2, you can do that here. We have discussed the room before as well as our basic inspiration and plan. Today we will talk a little about some of the details we have done so far. For those of you who might have stumbled upon this design post and are not familiar with the One Room Challenge it is the special concept devised by Linda F. of Calling it Home to set up a community of designers, plus lovers of design and DIY. The idea is to create motivation and support for a design project and encourage the participants to show their stuff and spread the word – now in its 11th (!) year and going strong and I am honored to participate…the kick in the pants is great, and the support is even better!! Follow along with the other Guest Participants ( over 200) and the wonderfully talented Featured Designers, who are working their magic. 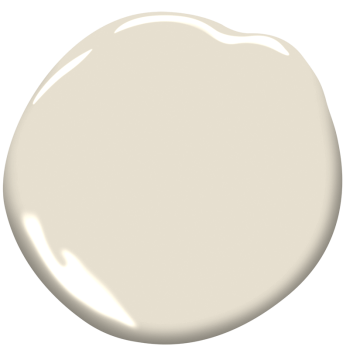 This week I want to talk a little about the paint colors and our progress so far. With such a strong color “Before” (purple), I felt it was really important to create a softer vibe with the new paint colors. Colors that would act as a subtle background to a variety of interests that Gianna might have throughout her teen years. I wanted the colors to support the main focus of the artwork, maps, bedding and textures rather than having the focus be a strong color as a wall paint. Something less “bossy” that will not drive the decor. 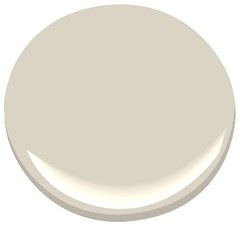 Gianna chose the wall color “Maritime White” OC-5 from Benjamin Moore to relate with the curtain fabric (we are using curtains in an interesting way -creating a special “room within a room”) and I love how it is a subtle white with a hint of “greige’ – like an old canvas sailcloth. 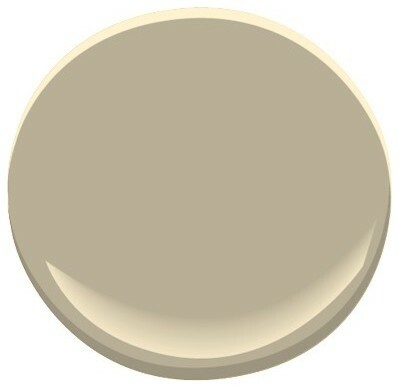 I wanted the trim to not just relate to the wall color but to be a very similar shade/color. I also planned to highlight the trim by using a semi-gloss finish – allowing the difference in sheen to be the focus. I went a little deeper with “Edgecomb Gray” HC-173…this is a light, soft warm gray that I have been using a lot lately. This combination of the trim and wall colors is really sublime and I am so happy to see it ( and the nice woodwork ) shine. 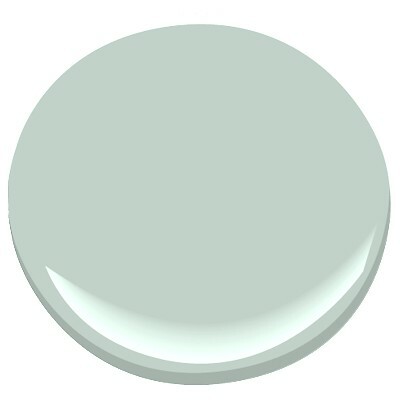 I added 2 supporting players by choosing a soft blue for the ceiling – “Palladian Blue” HC-144 and highlighting the built-in furniture, desk, bookcase and window seat with a soft sage green called “Sag Harbor Gray” HC-95. I love how everything works together and yet each element still stands out. 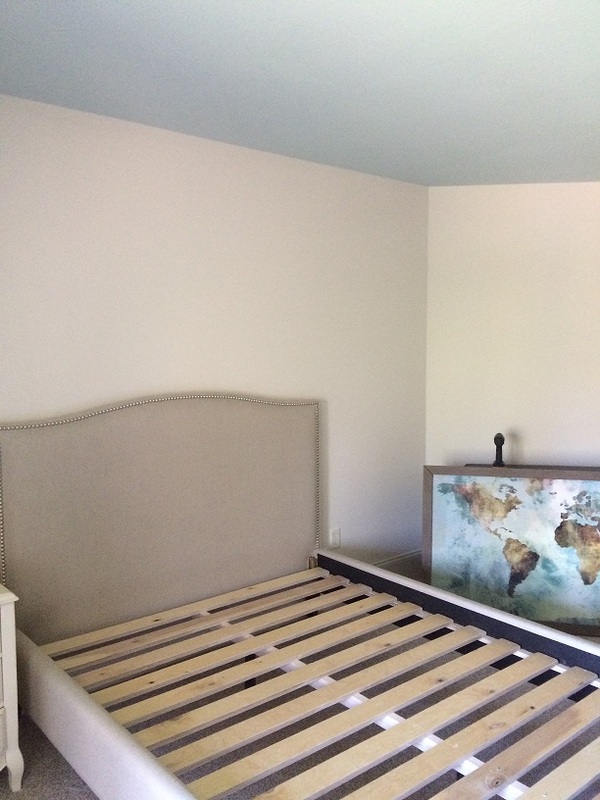 The painting is all complete and the main piece of furniture is in place – the bed! Still waiting for the mattress to arrive, but since this is a big first step! The new dresser is coming next week, the soft pink faux fur desk chair is here in all its funky style, and it looks really snazzy – just the right amount of humor for the serious corner of the room. Everyone is working hard to meet our challenge deadline, and I am feeling quietly confident about our progress – but I am not going to tempt fate by saying we have it all planned and ready. We still have to decide on bedding, artwork placement, and lighting, and that will be the focus of next week’s post!